As I just posted in the Slack Channel markets remain poised for moves....but nothing just yet. Let's first start with the S&P's. S&P 500: bullish....but will require patience. The price action off the August 29th highs is corrective and complex. Perhaps a "leading wedge" or "diagonal triangle"? Regardless, to me it is corrective and that tells us all we need to know. What remains unclear at this point is where prices will find support and build the steam to move higher. 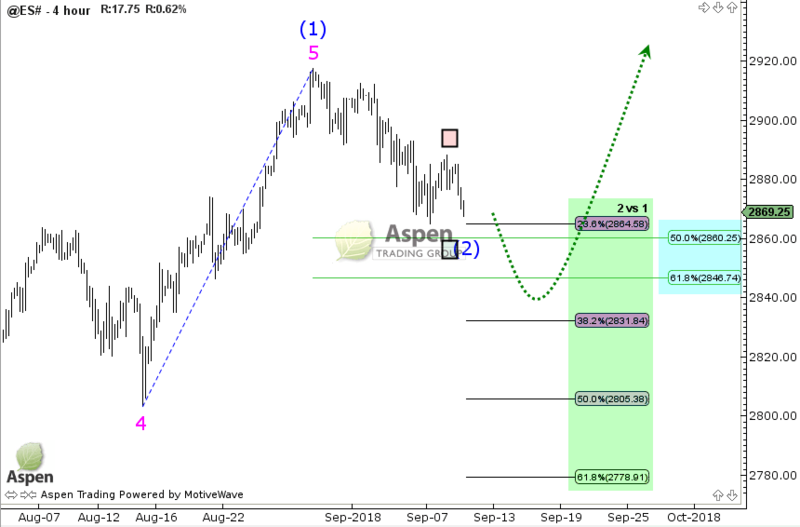 Wave (2) corrections will typically retrace 61.8% the length of Wave (1). So, in this case, we have only retraced 23.6% of the move...leaving 2778 a distinct possibility. Bottom line....patience. Some clients, myself included, should consider slowly scaling into long positions via the futures and/or SPY or PDP. Rather than trying to pinpoint the exact low, nearly impossible, we have our general range to work with. Keep the position size modest. Once prices gain traction and begin to turn higher in an impulsive manner, would then consider adding to round out the position. Aspen Trading Group´s FX Commentary, including any content or information contained within it or Aspen Trading Group´s web site, any site-related service, is provided “as is”, with all faults, with no representations or warranties of any kind, either expressed or implied, including, but not limited to, the implied warranties of merchantability, fitness for a particular purpose, and noninfringement. You assume total responsibility and risk for your use of Aspen Trading Group´s commentary/website, site-related services, and hyperlinked websites.